Film Screening – Vancouver Impressions (The early 1960s) – A programme of archival films produced by CBUT (CBC Vancouver) between 1961 and 1965. There has been a lot of talk recently about the CBC’s (English Services) Mass Digitization Project and their plan to trash all the original analogue media (16mm film, tape, transcription disc, etc.) once digitized. Their reasoning behind this plan is that they will no longer need the original artefact once it is digitized, so why pay for the storage of this material? In their minds digitization equals preservation – end of story. This is the height of hubris – CBC [mis]management are so confident in their digitization process that they aren’t even going to consider that anything could ever go wrong in the future, so they do not need to keep the analogue original? Nor, it seems, do they need to take into consideration that this “plan” is against all archival best practices for digitization. They don’t even appear to be willing to discuss the possibility of working with an outside archival repository to see if a mutually beneficial agreement could be made – like the recent agreement between PNG and the CoV Archives for the Sun & Province newspaper photographs. CBUT Station ID photo featuring the lights of Granville Street. Photo: Alvin Armstrong. Sadly, the destruction of original formats is only the tip of the iceberg in this story. The inside scoop is that the selection process is also flawed, namely that much archival material that won’t even make it to the digitization stage of the project. The CBC is only interested in digitizing (saleable) complete programs and not interested in program inserts, individual news items, stox footage, etc. This means the loss of much of Metro Vancouver’s and the Province’s audio-visual history. 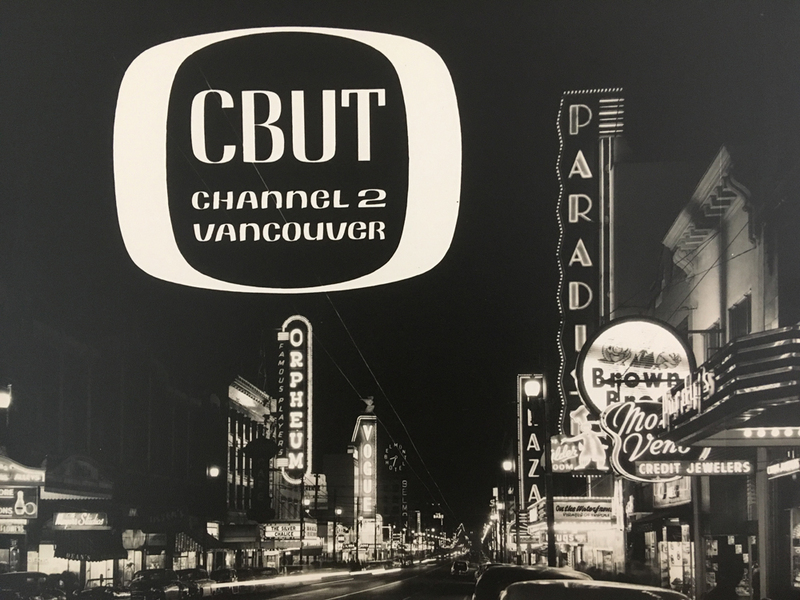 Check out my CBUT (CBC Vancouver) posts from a few years ago to see what kind of history could be lost forever: 60th Anniversary of CBUT part 1; Part 2 –All That Jazz ; Part 3 – 1954 British Empire & Commonwealth Games; and Part 4 – Drama from the left coast. Example of the kind of material (news film items & film inserts) in the Vancouver Archives that likely won’t be digitized nor kept. It’s heartbreaking to me – someone who spent 7 years working in the CBC Vancouver Archives identifying, preserving, and cataloguing over 46,000 media artefacts – to hear that all my hard work and the hard work of all my colleagues that worked on the CBC Archives Preservation Project will, for the most part, be for naught. What a waste! This is a major (potential) loss to local Vancouver & BC Audio-Visual history. It is important that the Canadian public is made aware of the kind of “crown assets” (the CBC is a crown corporation) that the CBC apparently is no longer interested in keeping and safeguarding for future generations. As taxpayers and citizens of this country, this is our collective history that they are putting at risk. This is not acceptable. So, that is why this screening is so important. But, it is not all gloom and doom….this will be a fun and entertaining afternoon. So, I hope you can join me. Early 1960s Vancouver: a city of neon signs, ‘ladies and escorts’ beer parlour entrances, and low-rise buildings. Vancouver today: a city of tech hubs, anodyne glass towers, and avocado toast. ‘Vancouver Impressions’ is a charming visual time capsule portraying a city much different from the one we know today. These five films represent early local television production when the CBC Vancouver film unit was a distinctive voice from a distinctive region of the country. They had the freedom to produce original stories from and about Vancouver, resulting in a rich catalogue of films that explored regional issues for a local audience. Not only are they illustrative of a lost time and place, but also representative of archives at risk, specifically the wealth of material housed in the CBC Vancouver Media Archives. Vancouver is always changing, but in many ways stays the same- plus ça change, plus c’est la même chose. These films not only document how much the city has changed, they also reveal that its residents had many of the same complaints and concerns we have today. It’s a Vancouver that we may not have known, but somehow are nostalgic for. ‘Vancouver Impressions’ focuses on the relationship between people and their environment and the interrelationships between the tangible and intangible aspects of the city. Shot in glorious Black & White and featuring an entertaining jazz and folk music soundtrack, ‘Vancouver Impressions’ is an audio-visual collage that is a treat for the eyes and the ears. It’s going to be a great show. Most of the material hasn’t been seen publicly since it first aired over 50 years ago! Sadly, this may be one of your last chances to see this material, so don’t miss out. A Day in the Life of a Bus Driver (1965) This short documentary follows a Vancouver bus driver through the course of a working day. His day starts and ends at the Oakridge Transit Centre and we ride along as he travels his route in suburban and downtown Vancouver. 11 min. A Day in the Life of A Postman (1964) The working day in the life of a Canada Postman is the focus of this short documentary. We follow a postman through a working day as he sorts and then delivers mail on his route (South Granville/Fairview). In voice-over, the unnamed ‘postie’ discusses the details and merits of his job. 8 min. A Day in the Life of a Waitress (1964) Follows a waitress through a working day at a busy downtown Vancouver coffee shop, the Burrard Coffee Shop in the Burrard Building at Georgia & Burrard. 11 min. This screening is presented by Jeffery Chong, Christine Hagemoen, and Colin Preston in association with the Audio-Visual Heritage Association of British Columbia (AVBC), a non-profit society established to promote and facilitate preservation, conservation and public access to the audio-visual heritage of British Columbia and Canada. This should all be made available as a DVD box set for those of us who would like to preserve it ourselves . . . how about it? That would be nice Jeff, but sadly it isn’t as simple as that since CBC still owns the copyright to the material being screened. Very foolish of them not to be marketing this material . . . look at what the BBC and the BFI offer in the way of historic film and documentary subjects. I know it doesn’t make any sense. To be fair, they do plan to “market” some of the material, but it is likely going to be a very narrow scope of material. Sadly, according to their current plan lots will be lost.